This 9kg washing machine from Samsung features special technology to make everyday life easier..
AddWash: Samsung WW90K7615OWs unique AddWash door is a clever mini door that lets you add to the wash, during the wash. Simply pause the programme at any point to add a missed towel or stray T-Shirt into the drum. Its really useful for adding in extra fabric conditioner or any delicate clothing that just needs a final rinse too. This one-of-a-kind feature is a smart way to ensure you never accidentally leave any items out of the wash again. ecobubble: Samsungs ecobubble™ Technology uses bubbles to give your clothes a deep clean. The optimal amount of water and detergent are mixed together to create bubbles before the programme starts. They soak into your fabrics at a rapid rate to quickly and effectively lift out dirt. This clever function allows you to wash at lower temperatures, saving you money on your bills. 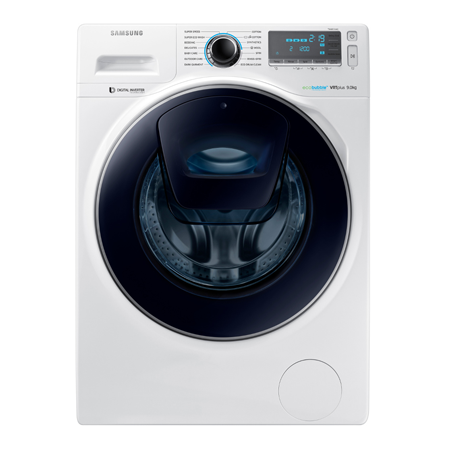 Smartphone App Control: Samsungs Smart Control technology will revolutionise your laundry routine. With smartphone app control, you can start, pause and monitor your washing machine from anywhere at any time. Simply load your machine before you leave the house and with the simple tap of your phone screen, you can set your clothes to wash so theyre ready to dry as soon as you arrive home. Samsung VRT: Samsungs Vibration Reduction Technology (VRT) helps keep vibrations and noise to a minimum. The use of ball bearings inside the machine aid the balance of the drum - no matter how much is in there or how fast the spin speed is. So your clothes are washed almost silently, making it ideal for running overnight.